Taiwan opposition leader Lien Chan has demanded a face-to-face meeting with President Chen Shui-bian over Taiwan's disputed presidential poll. 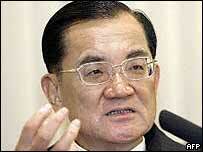 Mr Lien, the leader of the Nationalist Kuomintang Party, said it was the only way to defuse the crisis. A legal challenge by Mr Lien's party to force a recount is already underway. Mr Chen was re-elected with a majority of less than 30,000 out of the 13 million votes cast - a day after an apparent assassination attempt. Mr Lien is also demanding an independent investigation by international experts into Friday's shooting. 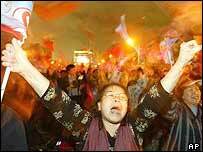 The dispute over the election led to big street protests by opposition supporters outside the presidential palace in the capital, Taipei. The row also sparked a sharp fall in share prices on Taiwan's stock market, with the main index dropping by more than 6% within minutes of opening on Monday morning. Opponents began their legal challenge shortly after it emerged Mr Chen had won. More than 330,000 votes were declared invalid - three times that of the last presidential election in 2000 - although a group opposing both main parties had campaigned for voters to submit blank papers as a protest. On Monday, Mr Lien said he wanted to meet the president to ask why he would not order a recount. "It has been three days and our highest leader has not given us an answer," Mr Lien - who last held face-to-face talks with Mr Chen in 2000 - told reporters in Taipei. "The government should, as soon as possible, give a reply to the people... It is a national problem," Mr Lien added. Meanwhile, Taiwan's high court has appointed three judges who are considering the KMT's request for the election results to be declared invalid. 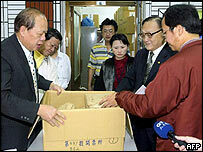 However, Taiwan's chief justice said it could take up to six months for the case to be heard. Any appeal could take just as long, the BBC Chris Hogg in Taipei reports. It is not clear how the legal challenge will now proceed, our correspondent says. Legal sources say one issue to be considered by the high court is whether the case should be decided by district courts throughout Taiwan, or by one judge in the high court. Taiwan's high court ordered more than 13,000 ballot boxes to be sealed after receiving the complaint from the two opposition leaders. Mr Lien is also demanding answers to questions about the mysterious shooting attack, in which Mr Chen and his Vice-President, Annette Lu, were slightly wounded. On Monday, some 20,000 opposition supporters continued to protest outside the presidential office - defying police attempts to disperse them. Protesters - accusing the government of dirty tricks - vowed not to go home without the promise of a vote recount. On Sunday, some 30,000 people demonstrated in Taipei. Protests were held elsewhere in the country, with clashes breaking out in both Taichung and Kaohsiung as protesters tried to break through police lines to reach court buildings. On Sunday, Mr Chen's Democratic Progressive Party moved to try to dispel the feeling that the shooting at a rally in Tainan was rigged. It released photographs showing Mr Chen being operated on for his injuries, which turned out to be relatively minor. Despite the president's election victory, he is being seen as having suffered a significant defeat with the failure of a referendum on relations with China after too few voters participated to make the result valid. President Chen called on China to accept his re-election and to remove the missiles aimed at the island Beijing considers a renegade province. Although China has not directly commented on the election result, it condemned the referendum in Taiwan, which it said was an attempt to "split the motherland". "Protestors are still holding out in front of the presidential palace"
Should there be a recount?